Five thousand metres high on the Tibetan Plateau, at minus 40 degrees, struggling in low oxygen. Stuck in the desert, two days from the next roadhouse, having lost all my water. Detained by Chinese police for cycling in forbidden territory. Waking up with no money or credit cards after being drugged and robbed by ladyboys in Singapore. The list goes on of conditions where I wondered how I would ever continue with my journey. 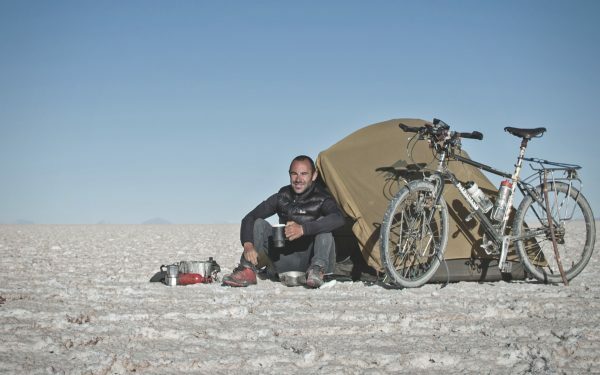 But in each situation, there was a bike and with it a reason to push on, to persevere with cycling around the world. Throughout my seven year, 51 country, 44,000 mile circumnavigation, there were many Tom Hanks’ Castaway moments. My most prominent memory of this is sitting high in the Bolivian Andes, as the morning sun warmed the frozen world; coffee began to boil on the camping stove and tears ran from my eyes. “I can’t imagine Dolly (my bike) as an inanimate object, we’ve been through so much together, we know each other’s limits and we support each other” I wrote in my diary that morning. Altitude does strange things to the mind, but there is truth in what I wrote. By that point we had been together for six and a half years, my longest relationship with human or bike and she was the only constant through my solitary adventure. But our relationship was not always smooth sailing. Dolly never failed me, but over the course of seven hard years, subjected to natures harshest elements, things around her inevitably failed. After three years of cycling and then sitting on a yacht through the South Pacific, the seat post became stuck fast in the frame. A Taiwanese metal worker said he’d remove it for $1. I watched as he melted the seat tube into the frame, like watching the end of Terminator 2, as metal melted, contorted and fractured. Then I began shouting and screaming as the paint on my beloved custom-built frame went up in flames and tubes began to warp. The seat tube is now hand painted by a graffiti artist, a tattoo-like memory of my time in Taiwan. The front rack cracked at just over 25,000 miles, in Alaska, where it was repaired professionally for $80. The rear rack did the same after 38,000 miles on the corrugations between the salt flats of Bolivia; there it was welded in a local man’s yard, with a piece of scrap tube for $5! By the end of South America, it seemed everything was falling apart, from pedals to panniers, to clothes and shoes, and in one week both tyres exploded beyond repair in the middle of the Brazilian rainforest. I became an expert in makeshift “on-the-road” repairs, using only duct tape, super glue and old inner tubes. Despite these problems, I cycled back in to Derby in 2017 on the same Mercian bike that I left on in 2010, adorned with new components, but the same bike at heart. The original frame, dented, scratched and tattooed, the same wheels with the original spokes that have never buckled. I made it around the world with one bike and little more. Two months after arriving home, I sat down in a chair rather than on a saddle, with the weight of financial and social responsibilities on my shoulders, and realised what incredible freedom I had experienced during life on the road. The simplicity of living with just a bike and the essentials for life, the heightened sensory experience of travelling through the world, hearing, seeing, smelling, feeling all that I passed through and the vulnerability that welcomed me into the homes of countless strangers. I thought that I would never experience freedom like that again and it upset me. In that moment, I put on a pair of shorts, clipped in to the pedals and cycled out into the countryside. I didn’t need to be cycling around the world, it didn’t matter where I was going because I was enjoying the journey; I was in control of my life, at my own pace, with all the space I needed to reflect on my own life. The bike had taken me around the world, and it continues to bring me to life.